My conference at Disneyland, CA. last week was wonderful. It is always so refreshing to learn new things about the field you are working in and get inspired to do better at your job. For myself, being a speaker and coordinator of this conference, it was especially exciting to see the attendees during the conference get inspired and rejuvenated about what they do each day at work. The Healthcare industry is what we call a “wild animal.” It is always changing, we never know what new technology is coming next and need to be able to keep up with the changes in a positive way in order to give our patients that best care that they deserve. Being at the first park that Walt Disney opened “his creation” is always exciting to me. I grew up in the Southern California, not too far from Disneyland. The park opened in 1955 and my parents took my siblings and I to the park when we were just young children. We watched over the decades the growth and changes in this Magical Kingdom. Even today as I strolled the streets I could feel the wonder and magical feeling that Walt wanted for all those who came to Disneyland. This is one of Walt’s policies for all of his employees. For me as a presenter it was a constant reminder that I too had to make sure that I presented in a way that my audience would approve of me and my appearance, which plays a big part in how people receive us. So often we think that our appearance does not really matter to those we encounter and serve each day at our place of employment. According to Walt, it does. Having a dress code and standard makes a big difference. Just think how you view those you come in contact with in the business world. Would you want to be served a meal in a restaurant by someone who was dirty and unkempt or a medical person who’s clothing was dirty or wrinkled? As much as we would like to think that our customers will accept us for who we are, they will make judgments of us on our appearance. 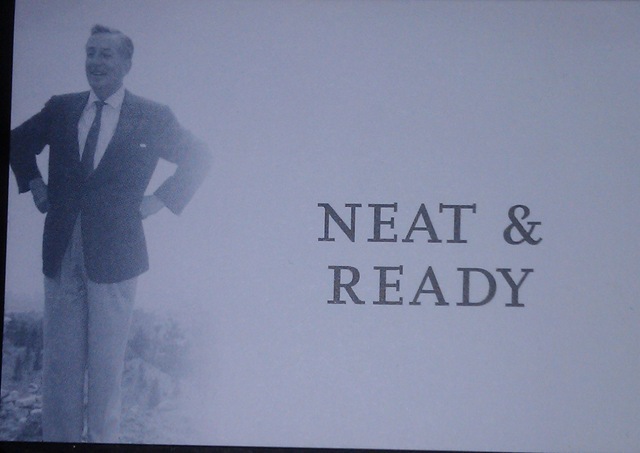 Walt knew this and made sure, and still makes sure, that each employee on the Disney properties looks “Neat & Ready” for work each day. You will not find one employee with a wrinkled uniform or hair that is out-of-place. Our appearance does make a difference on how people view us personally and view our business. 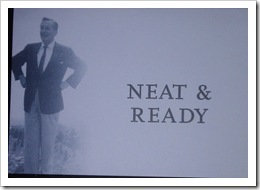 I think that Walt had the right idea when it came to wanting the best of his employees attitudes, actions and appearance. What do you think? This entry was posted on Tuesday, November 3rd, 2015 at 8:00 am by Tina Del Buono, PMAC. Filed under Business Improvement, Customer Service, Employee Training, Manager Topics, Medical Practice Management, office management, Self-improvement. You can follow any responses to this entry through the RSS 2.0 feed. Both comments and pings are currently closed.